Video shows M.E.B.A. crewed GREEN WAVE completing resupply of McMurdo Station, Antarctica. 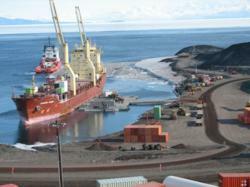 The M/V GREEN WAVE offloading cargo at the McMurdo Station in Antarctica. Photo Credit: U.S. Navy photo by Larry Larsson. The MV GREEN WAVE brought 100 percent of the fuel and around 80 percent of the supplies that people living and working across Antarctica need to endure the brutal winter and survive the year. The Marine Engineers' Beneficial Association (M.E.B.A.) is proud to announce that its members aboard the MV GREEN WAVE successfully completed the resupply mission of McMurdo Station in Antarctica. The MV GREEN WAVE is a privately operated Waterman Steamship Company vessel chartered to the Military Sealift Command. This mission, known as Operation Deep Freeze (ODF), is vital to the survival of researchers and support personnel who live and work in Antarctica. ODF is the annual Joint Task Force Support for Antarctica mission to resupply the remote scientific outpost. The MV GREEN WAVE brought 100 percent of the fuel and around 80 percent of the supplies that people living and working across Antarctica need to endure the brutal winter and survive the year. This year, the National Science Foundation utilized time-lapse cameras in four different locations to capture the entire set-up, delivery and execution of the ocean-borne mission. The video illustrates how the Antarctic modular causeway system was deployed and how it was used to offload and load the MV GREEN WAVE. Ordinarily the vessel would offload cargo at a 500-foot ice pier, however due to a warm winter the ice pier was not stable enough for dry cargo operations. The GREEN WAVE arrived with a disassembled modular causeway system from the U.S. Army's 331st Transportation Company (Causeway). When the vessel arrived, 41 Army personnel assembled the causeway and powered modular warping tugs in three days so that the offload could begin. The MV GREEN WAVE arrived at McMurdo Station on February 13 with over 6.8 million pounds of vital supplies, food, and research equipment. The vessel followed the MSC-chartered tanker MT MAERSK PEARY, which brought diesel, gasoline and jet fuel to the Station in late January. After the GREEN WAVE was offloaded, the vessel was reloaded with 391 pieces of cargo for transportation off the continent, including ice core samples that were carried back to the United States in sub-zero freezer containers. The ship also took on trash and recyclable materials for disposal. The vessel ended cargo operations on February 24 and departed the next day. It is expected to arrive at Port Hueneme, California on March 26. The M.E.B.A., supplies U.S. Coast Guard licensed deck and engineering officers in both the U.S. domestic and international trades. The organization was established in1875. Its members serve aboard container ships, tankers, propositioning vessels, roll-on/roll-off vessels, Lakers, tugs and barges, research vessels and in various capacities in the shoreside industries. In wartime, M.E.B.A. members work aboard virtually unarmed ships delivering critical defense cargo despite attacks from enemy aircrafts, submarines and warships. In times of peace our members still face dangers such as piracy on the high seas in order to best serve our country.